With James now at school and Evelyn regularly attending toddler groups Im always worrying about them bringing home bugs and getting ill. I know sometimes its inevitable but if there was a way to help cut the chances of this happening wouldn't you take it? We were recently asked to test out the AeraMax DX55 air purifier and I was intrigued to see if it would really work. 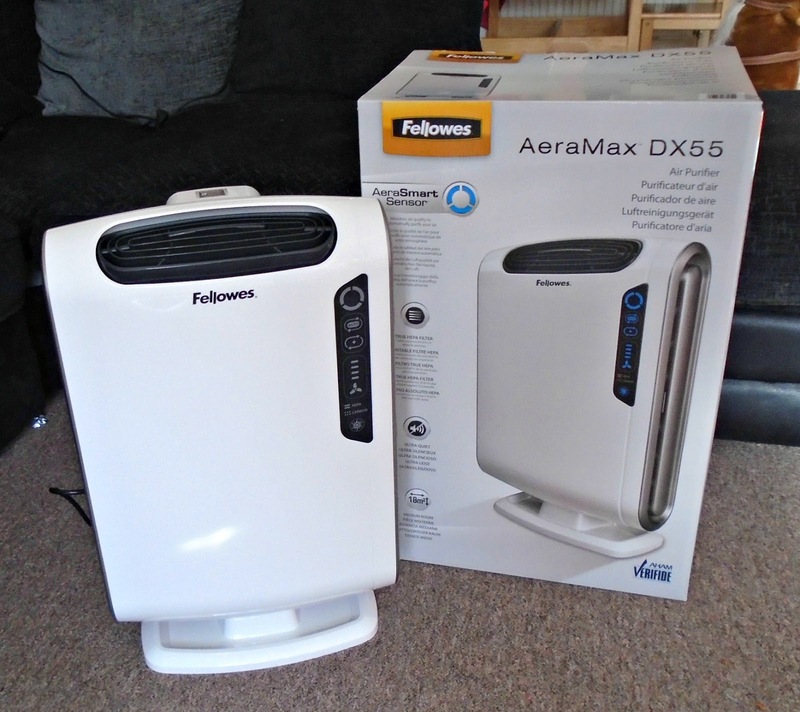 After having a read about the air purifier it would seem the AeraMax DX55 certainly cuts down the chances or those bugs and viruses staying in the air in our home and so I was excited to give it a try. It may be coincidence but we have had the AeraMax up and running for a little while now and nobody has come down with a cough or cold yet! Normally with this cold weather and 2 kids running around atleast one of us has come down with something, I will keep you updated though! We don't smoke or have pets but I was interested to hear it could help eliminate mould spores too. The AeraSafe™ Antimicrobial Treatment offers built-in protection from the growth of odour causing bacteria, mildew and fungi on True HEPA filter. Our house is terraced and seems to suffer quite badly with condensation in the winter. As you know the extra moisture seems to increase the chances of some mould building up around the window frames. Whilst we do of course wipe this down I do worry about the spores that could be in the air after cleaning it especially in the bedrooms where the condensation seems to be worse so it would could to know this could help capture those too. The AeraMax DX55 four-stage purification system captures 99.97% of airborne particles as small as 0.3 microns, including pollen and other allergens, dust mites, mould spores, pet dander and cigarette smoke. I placed the AeraMax DX55 in our living room, its the room we all spend the most time in and as our house is kind of open plan, I gathered this would probably be the best place for it to work at its best and provide the most benefit. The AeraMax is actually recommended for rooms up to 18m² so covers plenty of ground for a standard home. I really like the clean design and whilst I initially thought it looked quite bulky now its in place it is actually fine, it kind of reminds me of a portable heater. The AeraMax DX55 has a small black touchscreen display which is simply to use and understand and really responsive to touch. I like the fact it has lights that indicate just how clean your air is. 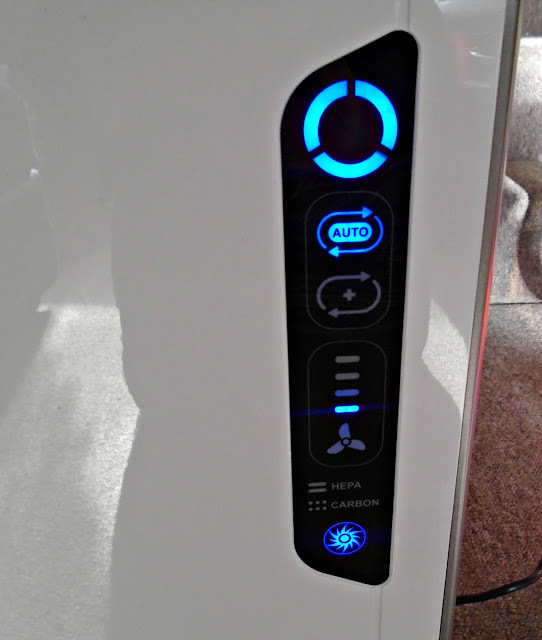 The AeraMax DX55 air purifier has 2 filters ( Carbon and True HEPA filter) which are easy to install and change. The display on the front will show a light indicating when these need changing too so no guess work is needed and you can be sure that your air purifier is working at its best at all times. I am looking forward to having this running in the spring/summer to see how it helps with hayfever as all of us seem to suffer during peak times. I will be sure to check back in with you all to let you know but judging from our results so far I think its going to be a big help. 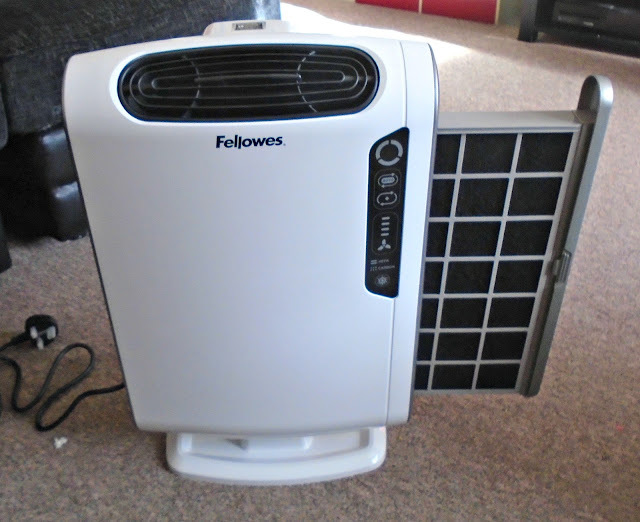 The Fellowes AeraMax DX55 air purifier is priced at around £199.99 which may seem like a large outlay but once you have the air purifier its only the filters to purchase. For me the price seems really reasonable for peace of mind that the air quality in our home has been significantly improved and we may just keep away those pesky bugs this winter! I am a member of the Mumsnet Bloggers Panel, a group of parent bloggers who have volunteered to review products, services, events and brands for Mumsnet. I have not paid for the product or to attend an event. I have editorial control and retain full editorial integrity. I have received a voucher for this post. I bet it's frustrating when they catch things from the other children! An air purifier is a great idea though! This sounds really interesting. Although it's quite pricey, like you said it is reasonable for peace of mind! I wish I had that last week, just caught a gross bug from my stepdad who got it from work! This sounds amazing. This is brilliant, yes it is expensive but the difference it can make in terms of allergies and breathing can change quality of life so much. This seems a little expensive to me, but I do love the design. Great review!